Australasia is well know for it’s adrenaline packed experiences, from Bunjee Jumping to 4WDriving and of course, jet boating. We recently made our way up to Noosa on Australia’s sunshine coast in Queensland and took a trip out on the aptly named Noosa Thriller. We’ve been on jetboats before in Australia and New Zealand and always found them to be packed with excitement and well worth the money, but Noosa Thriller skipper Bill insisted that his ride was something quite different. Jet Boats he told us are great for quick turns and spins, but there hulls are prone to cracking which makes them unsuitable for use out on the rough ocean. 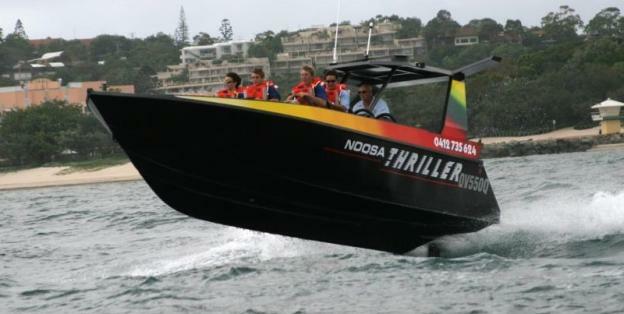 The Noosa Thriller however is not a jet boat but a more conventional metal hulled powerboat propeled by two roaring engines totally 500HP, allowing it to power its way up, over and occasionally through the ocean waves. The experience began with a detailed yet entertaining safety briefing from Bill, during which we got ourselves sitted comfortably on top of the seats constructed from inflatable gym balls in a steel frame, creating what is a very effective shock absorbing saddle for each passenger. With the briefing complete and goggles on, Bill fired up the engines and headed up the river towards the ocean. He then notified the coast guard that we were heading out and then let it rip! No one on board had anticipated the force and speed with which we would be propelled forward straight up and over the breaking waves, flying off the crests and crashing back down each time with a thump, with a mixture of laughter and screams, but it was now clear why we were sitting on gym balls. Our tour took us up and down the Noosa Coast for nearly an hour with grins on our faces as we jumped and turned through the waves with a precision and flair that can only be described as gob-smacking, and a great testiment to the skill and experience of our Skipper. Our tour took place on a day with rapidly changing weather conditions, ranging from intense sunshine to black skies and heavy rain, which did cause some lens fogging in the video above and perhaps doesn’t show it at its best, but even when the rain was hammering down, everyone on board was grinning from ear to ear. And when the tour did finally come to an end, Bill gave everyone one last thrill by pitching the front of the boat straight through a wave when we least expected, just to make sure that no one could return saying that they didn’t get wet! The Noosa Thriller is undoubtedly one of the most exciting and adrenaline packed experiences in Australia, living up to it’s name as not just the most thrilling experience in Noosa, but possibly the whole of Australia. If you love thrills and don’t mind getting wet, this is one experience not to be missed.